Columbus Georgia Murder Suspect Captured Today By SHERIFF VICTOR HILL’S Elite Fugitive Squad & Tactical Patrol. Murder Suspect Jonathan Swift could not live up to his name today to be swift enough to outrun Sheriff Victor Hill’s elite forces when they cornered him in a trailer park off of Hwy 85 today. When Sheriff’s Deputies spotted a vehicle that Swift was said to occupy, they converged on the car in the trailer park. Swift exited the vehicle and ran for his freedom, but soon found himself staring down the barrel of a rifle. Swift became wanted for a murder he committed in Columbus, Georgia in the parking lot of the Pizza Hut on April 6, 2018 on Buena Vista Road. Swift planned and committed an armed robbery and murder by stealing a suitcase containing 15 to 16 pounds of packaged marijuana from rapper Branden Denson. Branden Denson known as “Billion Dollar BD” was found shot three times in the back while sitting in the driver’s seat of his black Jeep Wrangler. 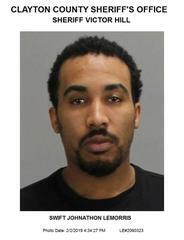 Swift has been on the run ever since, and perhaps would still be on the run had he not came to Clayton County. Because of this bad judgment, Swift is now facing the wall of Georgia’s toughest para-military jail now better known as the Hill-ton” waiting to be shipped back to Columbus, Georgia.